It was a wild, thrilling and rewarding trip to México City. I was invited by the Danish embassy to take part in a conference at UNAM university with my Copenhagenize hat on but there was ample Cycle Chic activities on the programme as well. The Cycle Chic brand/trademark is growing in leaps and bounds and it's thrilling to see how it appeals to so many people, not least in México. My head hurts trying to figure out how to blog the wealth of photos from the trip effectively but I suddenly felt like starting at the ending. Last day. Just ate with some friends and we're heading back to their place before I shoot off to the airport. 25 degrees, sunshine. Tired, hungover, happy but regretting the imminent departure. Walking through a park when Arlette says, "Look!" and Peter added an urgent "Take a picture!" What a way to go. What a sight to send me on my way. 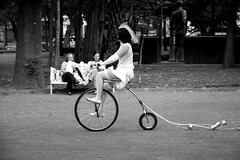 A just married couple pedalling and laughing on two mini penny farthings bicycles, complete with tin cans rattling behind. I couldn't possibly have invented a better send off gift for myself. México Cycle Chic Contest - Win a Biomega 'Boston' Bicycle. Whilst in México City we launched México Cycle Chic at a cracking party last Saturday. 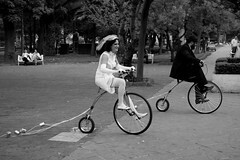 Mexicans - in México - can submit their best Cycle Chic shot to the group on Flickr and win a Biomega Boston bike. Check the group on Flickr here. 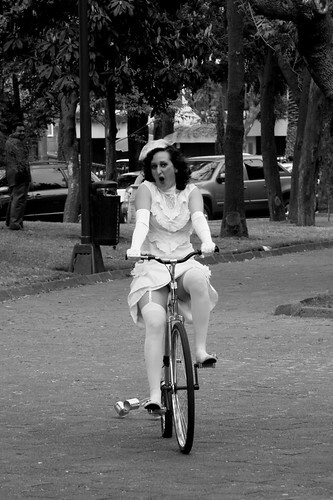 There's a bike for the best Gentleman shot and another for the best Lady shot. They must have known or feel your presence...LOVELY LOVELY SIGHT, INDEED!YOU LUCKY YOU! A friend who lives in Mexico City says the traffic is so chaotic and the city so large that it can never become cyclable, but we must reply "never say never" and imagine how much cleaner the air would be with a combination of bicycles and - for people who live far from their work, university etc - some kind of bicycle-bearing public transport. mexico city IS large, but it's just like any other city... a series of neighbourhoods that can be linked together with bicycle friendly infrastructure. so it's not at all impossible. Hey Look Mexico City Cycle Rocks!! 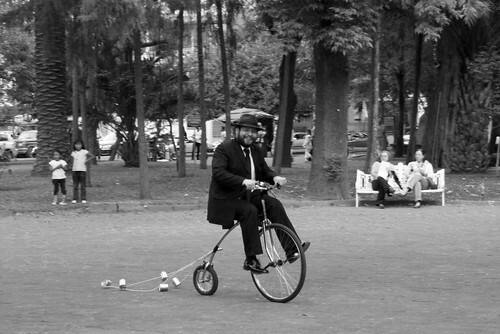 Super photos and a great adios salute for Don Cycle Chic Jefe. Believe or not, this monster city has huge cycle potential. The Mexican gulf is drying out and the resistence to the change will be overcome by pure nessesity.